Our family has enjoyed this twice now. It's quick and easy...and the whole family enjoys it. If a full jar of sauce is too saucy for your preference, just leave out a cup or so of the sauce. Even if you make your own homemade spaghetti sauce, this recipe is prepared with minimal effort. As a child, I thought ravioli only came from a can, and I was not a fan. Baked ravioli may not be made from scratch, but it is perfect for a busy night or after a day spent outdoors working. What's the easiest meal you make? No, you are not the only one who serves oatmeal for dinner - on occasion I've even stooped to cold cereal :) Thanks for an easy alternative! This is an interesting way to make ravioli, although I admit I'd probably use a home-made spaghetti sauce because I haven't used store-bought sauces in years. I'll have to give it a try! One of my quick-and-easy meals is tuna-noodle casserole. We frequently have pancakes or other breakfast foods for dinner, because I never want to make them in the mornings. Most mornings I'm doing good to grunt at people. always looking for quick recipes my teens can make and put in their own recipe file and we will be adding this one and cooking it soon thank for sharing have a great weekend. I haven't had rav's in a long time. I found your recipe over at the Treasure Box Tuesday link party. I host Tickle My Tastebuds Tuesday and would love it if you linked up this recipe. I’m sure our party goers would love it as much as I do. Here is the link http://bit.ly/1l4cu0j. Have a wonderful day!! 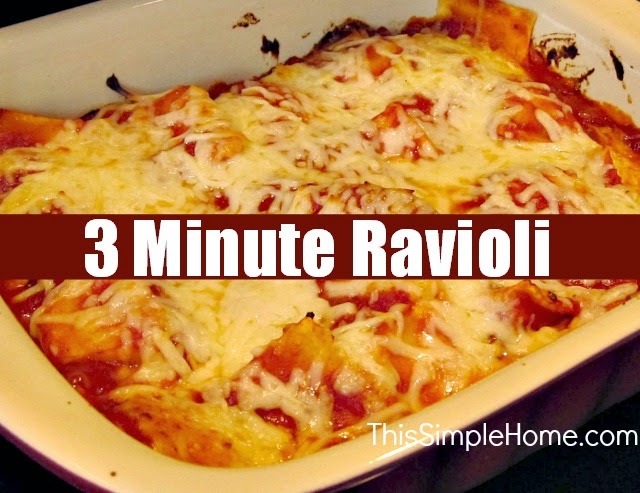 Love ravioli and love this recipe!! Thank you so much for linking up at Tasty Tuesday! Your recipe has been pinned to the Tasty Tuesday Pinterest board! Please join us again this week!